The FlashCore-N is a board designed for projects requiring mass serial communication capabilities. It is a C/C++ programmable embedded controller based on 40 MHz 186 CPU with 16-bit external data bus. The FN integrates 10 UARTs, 8 16-bit ADC inputs, 4 12-bit DACs and a 50-pin CompactFlash interface. In order to support high-speed communications, the FN serial ports are handled via DMA or FIFO (64 bytes), able to handle very high loads without losing any data. With the FlashCore, your embedded application can easily take advantage of the large storage capacity and fast access times of a CompactFlash Card for a range of mass data storage applications. The FlashCore can be used to store vast amounts of data, which can be later processed, transferred over the serial port, or directly accessed by a PC as files on the CF-card. 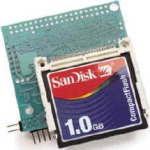 The 50-pin CF cards can also interface with PCs via a standard 50-68 pin PCMCIA adapter, or via special CompactFlash-compatible drives (available from SanDisk, for example) making these ideal storage solutions for applications requiring mass data exchange; all of this is available at a significantly lower cost than the 68-pin PCMCIA cards. Two internal UARTs from CPU, and 8 UARTs from 2 QUARTs (TL16C754B) provide a total of 10 UARTs. Six UARTs have on-board RS232 drivers, with handshaking signals (/RTS, and /CTS). One of these RS232 ports can be replaced with optional RS485 drivers. The other 4 UARTs provide TTL level signals only. C/C++ software libraries make accessing all ports an easy process. The two internal UARTs provided by the 186 processor support reliable DMA-driven serial communication up to 115,200 baud. The two quad UARTs (TL16C754B, TI) provide a total of 8 high speed serial ports, with each port featuring 64-byte transmit and 64-byte receive hardware FIFOs. These deep FIFOs can release processor load and support reliable performance for multi-serial port high speed communication. With dimensions of 3.6×2.9 in, the high performance 16-bit CPU uses 16-bit ACTF Flash (256 KW) and battery-backed SRAM (256 KW). There are 512-byte serial EEPROM, a real-time clock (DS1337, DS), and TTL I/Os. Six flow-control signals on each QUART can also be configured as general programmable TTL I/Os, adding to the 32 TTL I/Os available from the CPU. An optional 16-bit ADC (ADS8344, TI) provides 8 single-ended or 4 differential analog inputs (0-5V) at a sample rate of up to 10 K samples. Two 12-bit DAC chips (DAC7612, TI) provides 4 analog output channels (0-4.095V, 5 mA sink/source). Similar to other FlashCore variants, the FN allows access to mass storage CompactFlash cards (up to 1GB). Users can easily add mass data storage to their embedded application via RS232, TTL I2C, or parallel interface. Complete C/C++ programmable software package includes compiler, remote debugger, samples, and file system libraries. Files on the CF can be easily accessed from a PC, making the FN ideal for logging simultaneous serial data from many sources. An optional switching regulator (LM2575, NS) can be installed. It allows operating power input in the range of 6.5V to 30V DC, and can be shut-down with a single TTL pin. Very importantly, the FC can also be pre-configured with a simple serial (or TTL) interface that allows you to access the data storage capabilities of the board without using TERN development tools to program the application. This means you can add the mass data storage capabilities of this board to your existing system without having to learn yet another embedded development environment. Instead, you can interact with the board as a simple menu-driven serial device. With one serial command, begin dumping serial data into a file. With another, read that file back over the serial port. By using the FlashCore, users can easily add widely used CF standard mass data storage cards to their embedded application via RS232, TTL I2C, or parallel interface. TERN supports a complete C/C++ programmable software package (EV-P, or DV-P kit) which includes compiler, remote debugger, samples, and libraries. TERN software supports Linear Block Address mode, 16-bit FAT flash file system, RS-232, TTL I2C or parallel communication. A new suite of software libraries makes it possible for you to directly access this file system from your embedded device, as well. By using TERN boards offering access to Flash memory devices (the FlashCore and Memcard-A), your embedded application can open, read, write, and delete files. Click here to download the header file for these libraries, describing the software interface available to access the file system. Now, the TERN file system can also be directly accessed through the serial port without requiring the rest of the TERN development environment. A simple menu-driven interface for accessing the file-system can be directly programmed into the on-board Flash. 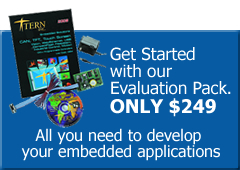 You can add embedded data storage capability to your embedded application for the price of a single FlashCore. 150 mA at 40 MHz. 32 I/O lines from CPU, 40+ I/Os total.